Download the programme here, for the UNECE FSOS Day please see further details below. NOTE: The UNECE Forest Sector Outlook Day was followed by a meeting of the UNECE/FAO Team of Specialist on Forest Sector Outlook on 15 January. For more information on the ToS meeting please click here. The UNECE/FAO Forestry and Timber Section analyses structural developments in the forest sector and produces studies on the long-term outlook for supply and demand for wood as well as other forest goods and services. These studies support policy and decision makers and analysts in Government, the civil society and the private sector. The key publications in this field of work are the Forest Sector Outlook Studies (FSOS), a series that started in 1952 with the European Timber Trend Studies. More recent publications are the European Forest Sector Outlook Study II, 2010-2030 (EFSOS II, published in 2011) and the North American Forest Sector Outlook Study (published in 2012). All these studies map out possible or likely future developments, based on past trends. A reference scenario and different policy scenarios provide a contribution to evidence-based policy formulation and decision-making. At the beginning of 2019, the next round of the FSOS was getting closer to the final publication. After a series of meetings in 2018 (which can be accessed here), modelling of FSOS scenarios was well under way. The meeting in Koli, Finland, allowed a wider audience to learn about the modelling results and provide their feedback. In addition, the event served as an exchange of current knowledge and experiences by other actors in forest sector outlook related work. Participants learned about national modelling efforts as well as international research. In addition, participants discussed future needs and possibilities for capacity building. Please find the concept note and the agenda of the meeting here. 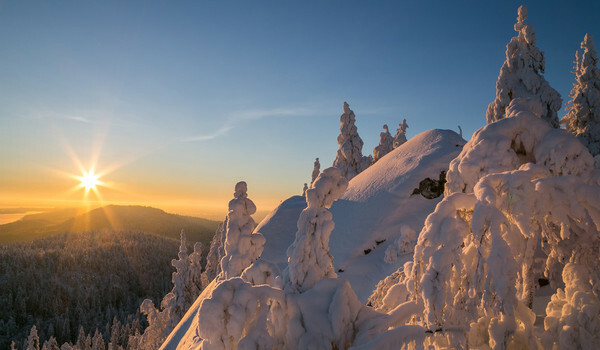 The event was held in the heart of Koli National Park, in eastern Finland. Should you have any question, please contact the Secretary of the ToS on Forest Sector Outlook Birgit Lia Fain (lia.fain@un.org).